Regular readers will know that DHC Deep Cleansing Oil is one of my favourite cleansers. I credit it as being part of the reason that my skin has been transformed over the past six months and it was recognised as my cleanser of the year in 2012's Skin Deep Beauty Awards. With this in mind, I was intrigued to see how I'd get on with the DHC Olive Corn Body Scrub & Polish. Although it is packaged in a pretty box, my first impression of the tube packaging was that it looked and felt cheap. It's made of that very malleable plastic which I don't generally find to be particularly luxurious and the paper label disintegrated on contact with water. Having said that, I did appreciate the functionality of the tube presentation. The product itself has a creamy formula, with a texture similar to body lotion. However, I didn't feel that it lived up to DHC's claims regarding hydrating and nourishing benefits in spite of the inclusion of olive oil and vitamin E. There is a high concentration of gently abrasive particles (from natural corn cob powder) and this makes for an effective scrub, which I enjoyed. It has a delicate lavender scent which isn't offensive. 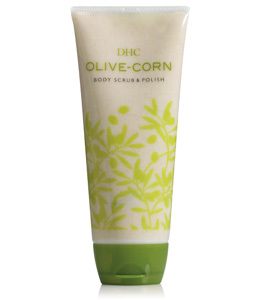 DHC Olive Corn Body Scrub & Polish creates a rich lather and whilst some may find this luxurious, I found that it dried out my skin- this was my main problem with the scrub. At £14 for 200g, I wouldn't repurchase this. I found it to be something of a "meh" product and I didn't enjoy it nearly as much as my (more affordable) Soap & Glory body scrubs. Also I want to add that I used this product and my skin is much more hydrated and looks younger. Nice review, always use product which suits your skin and keeps it hydrated.